Fibrocystic breast changes refer to noncancerous changes to the breast that may give it an altered texture (lumpy or rope-like). This condition may likely be due to hormone change during the menstrual cycle that affect great tissues. In reality fibrocystic breast changes are not actually abnormal (even though they can be symptomatic). 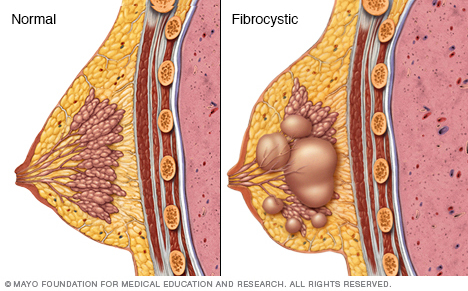 Pattern of symptoms: typically these fibrocystic breast changes are most bothersome before a woman’s period.